Jack Vernon Labbee, age 92, of Harrah, Wash., was welcomed into the loving arms of Jesus on Friday evening, May 26, 2017. He was able to spend his last three weeks at his home surrounded and cared for by his family. Jack was born in a farmhouse on November 24, 1924, a couple miles south of Harrah. The only child of Percy and Luella (Houghton) Labbee, he spent his childhood helping his father and grandfather doing various jobs on the farm, including working behind a team of horses and milking cows. On August 23, 1944, at the age of 19, he married his high school sweetheart, Lorraine McCorkle. They enjoyed more than 72 years of marriage and were blessed with four children: Patty, Jack D., Dan, and Don. At age 22, Jack, Lorr, ine and their two young children moved to Denver, Col., where he attended one semester at Western Bible Institute. Upon his father’s death in a private airplane crash he came back to Harrah to help his Mom care for the family farm. In spite of his father’s accident, Jack flew his own single engine airplanes for more than 50 years. His ranch included cattle and crops of sugar beets, corn, wheat, potatoes, and alfalfa seed. In 1947, neighbor Gerrit Schilperoort got Jack involved with a crop new to the Yakima Valley – peppermint. Thus began a 70-year career in the mint business.After 15 years of growing peppermint, Jack wanted to increase his mint production significantly but had limited acreage in Harrah. While maintaining the home farm, he ventured 100 miles Northeast to Othello, Wash., where there was unlimited new land available for peppermint production. After the large farm experience in the Columbia Basin in the 1960’s, he changed his focus from farming to marketing mint oils and formed a new company, Labbeemint, Inc. in Harrah. Now, after 50 years, through the efforts of family and employees, Labbeemint has become a major supplier of mint oils throughout the world. Jack enjoyed the opportunity to make many new friends in his business travels around the world. 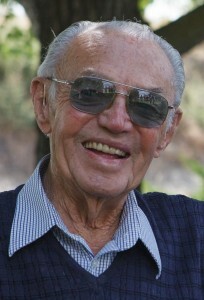 Jack was a farmer at heart and maintained his enjoyment of farming and the mint business throughout his retirement years. He so enjoyed seeing the business grow over the years and never met a building project (either his own or others’) he didn’t love! After 15 years of growing peppermint, Jack wanted to increase his mint production significantly but had limited acreage in Harrah. While maintaining the home farm, he ventured 100 miles Northeast to Othello, Wash., where there was unlimited new land available for peppermint production. After the large farm experience in the Columbia Basin in the 1960’s, he changed his focus from farming to marketing mint oils and formed a new company, Labbeemint, Inc. in Harrah. Now, after 50 years, through the efforts of family and employees, Labbeemint has become a major supplier of mint oils throughout the world. Jack enjoyed the opportunity to make many new friends in his business travels around the world. Jack was a farmer at heart and maintained his enjoyment of farming and the mint business throughout his retirement years. He so enjoyed seeing the business grow over the years and never met a building project (either his own or others’) he didn’t love! He served for many years on the board of directors of Sundown M Ranch as well as Heritage College/University. He was a lifelong member of the Harrah Grace Brethren Church. Jack loved his Lord and Savior, Jesus, his wife, family, and many relatives and especially enjoyed summer gatherings watching grandkids and eventually great grandkids swim and have fun together at the family swimming pool. One could never go wrong serving a plain old hot dog to Jack at those family gatherings! Jack is survived by his wife of 72 years, Lorraine Labbee of Harrah. Daughter Patty Cottrell of Harrah, granddaughter Juliana Cottrell of Seattle, granddaughter Natalie Cottrell of Seattle, great granddaughter Kyla Cottrell Chaney and great grandson Caleb Cottrell (son of deceased grandson Justin Cottrell). Son Jack D. Labbee and wife Bonnie of Wapato, grandson Shawn Labbee of Fall City, granddaughter Kara (Chad) Michael of Moxee, great grandson Jakob Michael and great-granddaughter Maegan Michael of Moxee. Son Dan Labbee and wife Karen of Seattle, grandson Ryker Labbee of Seattle, granddaughter Hilary (Jonathan) Young of Seattle, great granddaughter Holland and great-grandson Lincoln Young, granddaughter Allison (Jason) Davila of Harrah, great grandsons Oliver, Jack and Henry Davila, granddaughter Jennifer (Craig) St. Hilaire of Harrah and great-grandsons Owen, Silas, Ezra St. Hilaire and great granddaughter Grace St. Hilaire. Son Don Labbee and wife Pamela of Harrah, granddaughter Sarai (Seth) Thomas of Redmond, great-grandsons Elijah, Ryker, Cy, Rainn and great-granddaughter Phoebe Thomas, granddaughter Leah (Jeff) Clark of Yakima, great granddaughters McKayla, Maudie and Madison Clark, granddaughter Anna (Nicolay) Thomassen of West Seattle, great granddaughters Tevya and Zemme Thomassen, grandson Tyler (Patricia) Labbee of Harrah, great grandson Judah Jack, great-granddaughter Lydia, great grandson Leo, granddaughter Laura (Micah) Cade of San Diego, great grandson Isaiah, great-granddaughters, Makenna, Eliana Cade and granddaughter Mary (Sterling) Coyle of West Seattle. He was proceeded in death by his father, mother, and grandson Justin Cottrell. A memorial service will be held on Sunday, June 4, at 4:00 pm at the Harrah Grace Brethren Church, Pastor Peter Touhey officiating. A private family burial service will be held earlier in the week at the Reservation Community Memorial Park west of Wapato, Wash. The family wishes to thank all of those who cared for Jack and his family over the past few weeks, especially the kind folks from Heartlinks Hospice Care of Sunnyside. A special thanks to chauffeur Darrel Scott for his driving skills, friendship, and care for Jack and Lorraine over the past two years. In lieu of flowers, donations can be made in Jack’s name to the Union Gospel Mission, 1300 N 1st St, Yakima, Wash.
Merrit Funeral Home of Wapato, WA is in charge of arrangements. We send our late condolences from the Malick's and Green's, we just found out about Jack's death. Carla Green sends her condolences and sympathy to your family I am her sister Sharon and I as well send mine even though we never met.